Intriguing, aren't they? Pancakes...made of cornmeal. Perhaps not the first whole grain you'd jump to if you were looking to change up your favorite breakfast food. Mark Bittman of the New York Times wrote this week about pancakes. About whole grain pancakes, specifically. Have you ever thought about the intrinsic value of pancakes? I mean, pancakes sans maple syrup, butter, powdered sugar, etc. What are pancakes without all those frills? Don't get me wrong - they are delicious frills, and personally, I am usually okay with the thought of a pancake serving a purely vehicular purpose. As a simple means of transporting maple syrup from the plate to my mouth. But I will admit, they are not the healthiest option, nor do the plainest ones taste like much if you take away the maple syrup. So I decided to adapt this particular recipe from Mark Bittman's column, which was already inherently gluten-free, but which I predicted might lack the sweetness I'd want to have in my pancakes. So I added a little sugar - not much, but enough to bring a tinge of sweetness - and a dash of cinnamon. And they were actually good. Golden crisp, they held their own in flavor and became even better when drizzled with agave nectar (you could also use honey or maple syrup). I won't claim that these are necessarily healthier than regular pancakes (although being devoid of processed starches is at least one point in their favor). But I think you'll enjoy the new flavor in this creative, whole grain departure from an old favorite. Combine the cornmeal and salt, and then add the boiling water. Let it sit for about 8 minutes to soften the cornmeal. Slowly add the hemp milk bit by bit, stirring to mix well. Add the rest of the ingredients and stir well. Spray a nonstick frying pan with cooking spray and heat over medium heat. When it is fully preheated (when a drop of water sizzles on it), spoon about 1/6th - 1/4th cup of batter per pancake onto the griddle. Cook for about 4 minutes (until small bubbles start to appear or the bottom becomes nicely browned) and flip, cooking for another 4 - 5 minutes, until they are done all the way through. Serve with your favorite toppings (I had mine with a scoop of almond butter and a drizzle of agave nectar, but go crazy with your own favorites!). Hint: You could also make these savory by omitting the sugar and adding in your favorite herbs, such as basil, oregano, thyme, or rosemary, and serving as a side dish for dinner or lunch. You know how granola you buy at the store always has that wonderful crunch? It's not the crunch of over-baking - it's the crunch of perfect baking. Not too hard, and not too soft. It's the kind you marvel at with each bite - light, crisp, and utterly addictive. It's a melt-in-your-mouth kind of crunch. Yesterday, somehow, I hit upon a magical combination of ingredients, baking temperature, and baking time. I'm not saying this recipe is perfect yet. But I'm sharing it with you because it is really, really, really good - by far, the best granola I've ever made. The flavor is addictive, and the best part is that it doesn't rely on a lot of oil for its texture. Instead, it's packed full of nuts, pure nut butter, and seeds. If you can't have any of the ingredients listed, you can easily substitute the same amount of something else. For instance, if you can't have nuts, use all Sunbutter; if you can't have almond butter, you can substitute all Sunbutter or use peanut butter instead. Don't like sesame seeds? Leave them out and put in more flaxseeds. If you like dried fruit in your granola, go ahead and add some. I'm going to keep working on it until it's perfect, but for now, this makes a fantastic breakfast on its own, or sprinkled over some fruit and yoghurt. It's full of flavor - but it's also healthy. And the crunch? That's the best part. It's there, too. Preheat oven to 300 F. Spray a glass baking dish with non-stick spray. In a large mixing bowl, combine the oats, coconut, ground cashews, almond meal, flaxseed, sesame seeds, buckwheat flour, cinnamon, and salt. Mix well and set aside. In a small saucepan, combine the brown sugar, water, Earth Balance, honey, agave nectar, almond butter, Sunbutter, and vanilla. Heat over medium heat until it starts to simmer and everything has melted together. Pour immediately over the dry ingredients and stir very well to mix. Make sure all of the dry ingredients have been coated. At this point, the granola will be very sticky and will look like one big clump. Spread into the glass pan and place in the oven. Bake at 300 F for 45 - 50 minutes, reaching in every 5 - 7 minutes to stir. If you want lots of big chunks in your granola, don't break up the clumps; if you want lots of smaller clumps, do a stir-and-chop to get the consistency you want. The granola is done when it's got a sort of golden hue and when the clumps are not breaking apart easily when you stir the granola. They will not be completely crunchy yet (they'll get crunchier as they cool), but they should taste kind of toasted - slightly hard on the outside and a little softer on the inside. Remove to a large plate or another pan and spread out to cool. When completely cooled, store in a container with an airtight lid in the refrigerator for longer shelf-life. I'm a convert. A soda bread convert, that is. It's not like I used to hate soda bread or anything. I don't even know that I ever even tried a regular piece before being diagnosed with celiac. And maybe that's why I was never particularly compelled to make a gluten-free version of it. If only I had known, I might have tried this recipe years ago. It's a bread that sits on the fence, with a hint of sweetness on the one side and a slightly bitter aftertaste that gives you pause, and then makes you want to take another bite, and another, and another. It doesn't taste quite like a regular loaf of bread, but also doesn't taste like a dessert bread. It's fantastically in between the two, and to make it even better, it comes together very quickly since you don't need to proof any yeast. The raisins add intermittent splashes of subtle sweetness (hint: try using the raisins that are specifically for baking so they don't dry out as much). Absolutely perfect with a steaming cup of tea or coffee, this bread is pretty addictive. Since I have learned not to trust my own taste buds as indicators of what others will find delicious, I tested it on several friends who can eat gluten; one friend took one bite before proclaiming "Oh, it's delicious! ", while another (who is a huge fan of regular soda bread) called it, in his own words, "DAMN good" (he really did put that emphasis on DAMN, I swear). 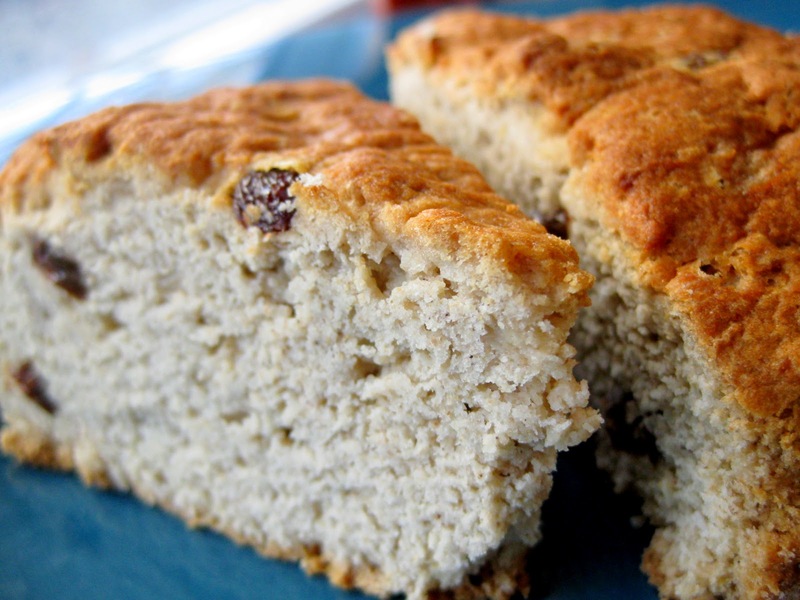 Having never made a regular loaf of Irish soda bread before, I was unsure about the texture. I knew it was supposed to be a very sturdy bread, but even though it called for 30 minutes of baking, I got nervous after the top was dark brown after only 25 minutes and took it out of the oven then. It was baked through, but ended up being rather soft when it cooled. Unless you're really wanting that particularly hard texture, this isn't necessarily a bad thing, and besides, it firmed up quite nicely after 2 days in the fridge. However, if you want to eat a firmer loaf, I'd suggest either baking it for longer at a lower temperature (perhaps 325 F instead of 375) or making it a day or two before you want to serve it. You can find the recipe I followed from the Gluten-free Goddess here. I used Sunmaid Baking Raisins, substituted a real egg for the egg replacer, and also brushed a thin layer of hemp milk over the top of the loaf before baking to give the crust more of a sheen and crunch. Make this when you have someone to share it with - they'll appreciate it! Divide the dough into 2 or 3 flattened discs and work with one at a time. Roll the dough out on a lightly floured board to a thickness of about 1/8 inch. Depending on how sticky your dough is, you may need to use quite a bit more white rice flour to make it workable. Don't fret, though - they'll still be delicious! We used the top of a cup with a diameter of 2.5 inches to cut out rounds from the dough. As you run out of space to cut dough from, rework and roll the dough out again, as many times as necessary until you run out of dough completely.